We, the undersigned journalists and members of civil society are shocked and distressed at the serious violation of privacy of Ms Sandhya Ravishankar and the threats to her life, following her investigative reports on mining. We are particularly disturbed at the manner in which her repeated complaints to Chennai police have not met with the attention they deserve. There has been no satisfactory follow up by police much less any attempt to secure her privacy and protection. Ms Ravishankar is a well known journalist covering political and caste-related issues for several years. She has done several important investigative reports, notably the report on the arithmetic flaws in connection with the acquittal of the late Tamil Nadu Chief Minister J Jayalalitha by the Madras High Court and the delay in the release of the dam waters from Chembarambakkam in 2015 which resulted in floods in Chennai. For the last five years, Ms Ravishankar has done sterling work as a journalist in documenting illegal sand mining by the mining and rare earth minerals export company, VV Mineral, headed by Mr S Vaikundarajan. Several prominent media outlets have published her articles and reports. However, the mining company and their associates have responded by subjecting her to intense harassment and have threatened her in an effort to intimidate and stop her work. On January 30, 2017, she submitted a complaint about these threats and the harassment she faced to then Commissioner of Police, Mr S George. Despite this, there was no let up in the harassment and, on March 20, 2017, she followed it by with separate complaints to both the DGP Mr TK Rajendran as well as the Chief Secretary Ms Girija Vaidyanathan. Shockingly, in September 2017, she learnt that an unidentified biker was taking photographs of her bike parked outside her residence. Disturbed at what was clearly an attempt to stalk her and record her movements as well as her vehicle, she filed a complaint with your office on September 11, 2017, clearly stating her apprehensions about the threat to her life. Please note that there has been no progress whatsoever in investigation of any of these complaints so far. 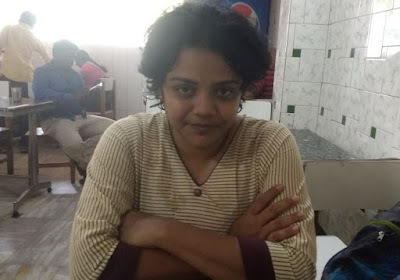 Last week, Ms Ravishankar found that a Twitter handle (@savukku) and a blog report by Savukku (alias of journalist Shankar) which refers to her meeting with a retired police officer and makes wild and unsubstantiated allegations that she was "leaking" information about political party rivalry in Tamil Nadu. What was more disturbing was that a clip of a CCTV video of Ms Ravishankar walking into a cafe in Chennai, and meeting a source, was uploaded on the blog. Ms Ravishankar has filed a complaint with you (dtd. September 24, 2018) and has alleged that her own preliminary inquiries with the café owner revealed that the CCTV visuals were procured by the Chennai police at the behest of a senior police officer of DGP rank purportedly close to the miner Mr Vaikundarajan. Sir, it is clear from all these complaints as well as the latest incident, that Ms Ravishankar’s harassers are bent on a campaign of stalking and intimidation of her and will go to any lengths to violate her privacy and threaten her safety and security. They have, in the past, openly shared and doxed her personal details and compromised her safety. Despite all her complaints, they have continued to do so with total impunity and secure in the knowledge that their actions will not be investigated into and they will not face any charges for their completely illegal acts. Sir, you are aware that any dereliction of duty on the part of your officers will reflect poorly on your office and your mandate to protect the rights of citizens. Furthermore, you are well aware that journalists play a very important role in exposing corruption and illegalities of the powerful and any attempt to intimidate and threaten these messengers of truth is censorship and silencing of the truth. It is a gross violation of freedom of expression. Sir, we demand that your office take serious and immediate note of these complaints and direct your officers to investigate the complaints without further delay. We demand strict and immediate action against the trolling and harassment she is facing. We demand that an administrative enquiry be conducted into the record of and publication of CCTV footage of Ms Ravishankar and her protection from any further intrusions on her privacy. Furthermore, we demand that your office provide clear and unequivocal assurances that her safety and security are not further compromised.